This mare needs no introduction and is a pillar of our breeding program. Pride is a shining example of a proper traditional Gypsy we strive for! We have been very blessed to add Pride to our breeding program, as she is one of Steve Down's top producing mares and bred by Steve's late father Alfie Down. Pride's offspring have been stamped not only with quality, but a amazing mind to backup the whole package. Pride has gone on to produce champions in the show ring and incredible breeding stock with the majority being retained by Steve for his breeding program. Pride is built like a stallion with an abundant of flat bone, thick thick feather, excellent mane & tail that is silky soft and this girl has a ground covering stride to top it all off! Pride has been re-bred to Double Stuff for a 5/2019 filly! Pride will be paired with Oreo again for a 2020 foal! This fantastic mare is one of the heaviest Blue Blagdons bred by the Downs. Star is gonna be bred to SD Big News and imported this fall. We are so excited for this addition!! This mare brings size, build, bone, hair, blue eyes, and outstanding breeding to our program from some of the lines that are not readily available on the dams side. *** Prada will be offered for sale in 2020*** So if you are looking for a serious producer, she will not disappoint! Can sell open, in foal, or in foal to your choice of stallion. We have retained a daughter and will be retaining her 2019 foal along with having Prada's full sister, so we need to expand our lines. Imported from the SD Farm in the UK 12/2015, SD Prada was in foal to SD The Don and foaled a stunning filly SD The Diva Wears Prada 4/20/2016. 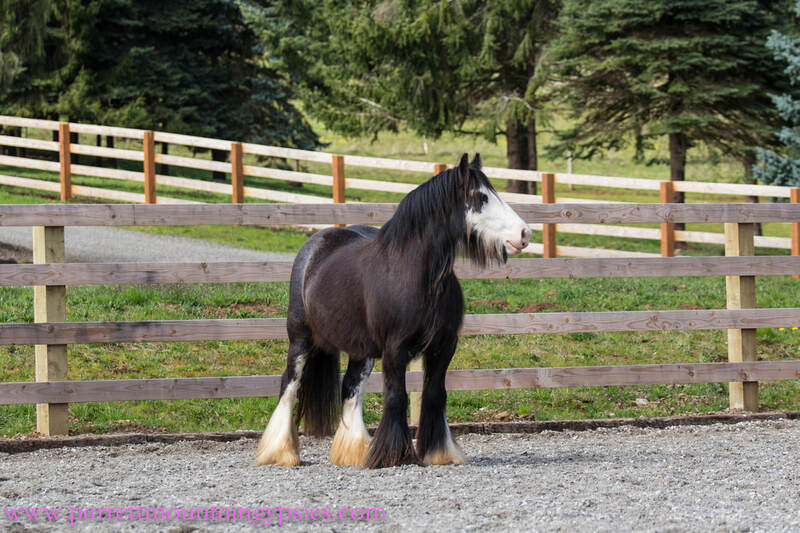 Prada turns five this year, has an abundance of silky feather; from her hock to hoof and the front of her cannon bones down to the ground, double tail, silky mane and is one of the sweetest natured gypsies we have ever met! Prada is very willing and has started her saddle training and will hopefully enter the show ring one of these years, but her value to us as a brood mare is of more value than risk injury. When she is on her off year from breeding, we will pursue. Prada has quickly become my favorite mare just simply because of her sweet sweet attitude and she is so easy and kind. She is well on her way of being a serious producer, passing on her amazing back breeding to her offspring. Prada's sire is world class and her dam Big Bare is a very heavy proper traditional Cob! Big Bear's dam is SD Bambi, one of Stevie Down's (son of Steve Down) beautiful mares. We are so impressed with this girl, we have asked the Down's to let us know if they ever have a full sibling to Prada as we would love to add another of her quality and brains to our lineup, and guess what... we added her full sister SD Tesla to the PMG family!! ​How about this girl?! This girl is my dream mare through and through! I feel beyond fortunate to add this increadible girl to our lineup. Her barn name is Red, I know, original LOL. When Red was presented to me I couldn't even speak. I knew she was coming to live with us the instant I saw her pictures. Red is a seasoned driving mare that has been driving all of her adult life and got her name from her previous owner (who passed away) because he would drive Red to the pub to drink lager's. So hence The Lager Mare. Red is also broke to ride and will be in the show ring in 2020. Red is in pasture condition in these photos. Red has had one foal prior to coming to the U.S., which sold at Appleby for a huge sum of money. Red has blessed us with an amazing colt 8/8/17! SD The Big Lager aka Porter. Red has been bred to Master Plan for a 8/1/18 foal. Master Plan has a red gene, so hoping for a red sabino:) 7/25/18 Red blessed us with a amazing red sabino colt!! We have named him Code Red and are retaining him at this time. There are not enough proper chestnut boys out there and this guy is gonna make his daddy proud! We are very excited to pair Red up with SD Avalanche with a guaranteed Palomino! If the foal is a colt, it will be for sale!! A sexing ultrasound will be done 60 days after conception. $15K payment plan available. Contract not available till after conformation and sexing. We can also rebreed to the same stallion for a 2021 foal and offer that one on a long term payment plan. When I first laid eyes on Master Plan, this sweet filly was in the same barn with him and I instantly fell for her sweet face and very kind eye, but knew I needed a mare in foal before buying young stock, but as it worked out, she now calls PMG home:). ​We are blessed to have this amazing quality girl in our lineup. Dixie is a Blue Blagdon and will retain her roaning/grey coloring; being dark in the winter and light grey in the summer. Not only is this mare have great feather, she has body. Dixie has undergone 90 days of saddle training and was started by a skilled 13 yr old girl! Dixie's sire: SD Dixie's Dancer, grandsire: SD Flash Harry (SD Jim X SD Pink Palomino), great great grandsire: Bob the Blagdon! That's just on her sire's side! Dixie's dam is being DNA verified so we can make that information available. ​Dixie was open for 2017 and is bred to Gold Digger for 7/2019 foal!! Dixie will be paired with SD Big Bucks for a 2020 keeper foal!! Diva is everything we hoped for and then some and a beautiful Black Blagdon at that with a nice belly spot! Sire is SD The Don. Diva has a very calm attitude and is very very sweet. This girl loves her scratches and to just be hugged. She is one of the largest fillies we have seen and has an incredible amount of feather, nice neck, double mane & tail and great bone!! We are retaining Diva for our breeding/showing program. Diva has the most loving quiet personality of all our heard, like her mum. Diva is gonna be a big girl, at already 14hh at 16 months old, we expect this girl to reach at least 14.2HH! Diva will be bred to an amazing boy that will complement her to a T when she is of age! This incredible filly was utterly a total surprise from Jack! Jack surprised me with her for Christmas on our trip over to England Christmas 2018! Video posted on our Facebook page. Holly is out of SD Downs Dolly & by Streetfighter! Very excited to have more of Streetfighters get in our program! Downs Dolly is a very coveted mare of Stevie Downs that boasts bone, body, and hair. Holly has a full sibling in the states that is an outstanding colt owned by Golden Oak Gypsies. This bay beauty will be in our show lineup for 2019 if she is not going through a growth spurt! This Black Blagdon girl is nothing but a premium filly! Not only is Lady Jane the complete package and is gonna be a big traditional mare. Lady Jane's dam is the stunning producer Izzy who is a big producer!! Lady and Diva will be our driving team since they look so similar! Lady will be paired with a very special SD stallion before we bring her over. She will be bred in the spring of 2019 when she is of age, then join our family the fall of 2019. We are beyond excited that Lady Jane will be paired with SD Big News!! Dream is a Streetfighter daughter that has serious quality in conformation, build and hair! This girl was put in foal to a SD Simply The One (son of Woolly Mammoth X Simply The Best) and is a darling well built colt we named The Bandit Man. Bandit will have SD Woolly Mammoth on BOTH sides!! When I saw pictures of Dream, I fell in love! When I saw Dream for the second time in August 2017, I was speechless. She adds a whole new dynamic to our heard and raises the bar on quality. Not only is Dream beautiful, she is very very sweet. Usually when we get the mares from the UK with little to no handling it takes a bit for them to warm up, not this girl! She loves sweet kisses on her muzzle and hugs. Dream has been paired with SD Double Stuff for a 6/11/2019. This foal will be a KEEPER if a filly!! ​Dream is going to be paired up with SD Empire for a 2020 foal!!! ​This Blue Blagdon filly is gonna be a beautiful girl. We love her full sister Prada so much that I told Janey if they ever repeat that breeding and get a filly, I would take her in a heartbeat if they were willing to sell her. Stevie said yes and she is in our herd lineup. She is a stunning chocolate color with a partial blue eye! ​I am excited to pair this fancy girl up with Double Stuff in 2020!! This girl is pure class and perfection! DD is out of a mare I have admired for years and of course one of thee best blue roan stallions out there!! DD !! One of thee best fillies I have seen while walking the fields of England. She will be a huge asset to our showing and breeding program. She is defiantly one of a kind and we are beyond elated we were chosen to be her family! It has been so hard not to share this filly sooner, but wanted to wait till we arrived home from our trip over Christmas & got Missy home. Missy is even better than we could have wished for, massive bone, hair, body and built like a buffalo and as sweet as sugar! ​I am day dreaming of her future offspring. We will not know who we are pairing with till Missy matures a bit more. Sassy has one blue eye and not sure about color genetics yet, will send off when she is released from CEM quarantine in a few weeks. But she is compact, has good feather and nice bone coming on. Sassy is in for to a very beautiful B&W mini Gypsy Cob stallion SD The Conquerer!! This foal will be retained if it is a filly. This is Sassy's first foal. Sassy will be put in foal to Pistol for 2020! We do not have a height on Sassy yet, but guessing she is about 11.1hh!!! ​Sassy will be paired to SD Pistol Pete for a 2020 foal!! This foal is for sale!! This is one I have had my eye on every time I have come across her photo! A stunning Black Blagdon mare that we can use in our Mini program or just a perfect size for the smaller adult. She will be amazing for Legacy or Pistol. She is the size I can ride, so I am pretty excited about the quality, build, and size she will bring to our program. Minnie is a very sweet Gypsy and is quiet and kind. I truly enjoy spending time with this girl!! Gypsy is also one of Steve Downs special mini mares that he bred down without any Mini outside bloodlines. ​Minnie will be paired with SD Pistol Pete or Legacy for a 2020 foal!! That about sums up our program. We have selected these Gypsies each for a reason, each for a purpose, each for what our eye loves. They will not be perfect, but we are working hard to keeping to the breed standard in which the Romani Gypsy people have formed over the years. We are staying on the smaller side of breeding, under 30 head because we can't give them the attention they deserve if we are tooo big. We want to offer personalized training for our stock that fits the needs of our customers. There are so many people out breeding to make money and earn back their investment. Breeding to light of body, no bone, light feather, course heads, etc... Breeding stock should be only the best. It doesn't matter if you buy a horse from us, or the breeder down the road, just do your homework, ask lots of questions, and enjoy the heck out of your Gypsy! !